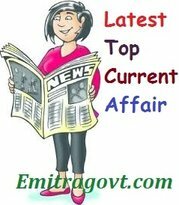 Current Affairs Question 2017: Looking for 7st August Current Affairs? Then start your Quiz right now by answering them. Here in this article, we are giving the Current Affairs Quiz with Questions and Answers. As many people are preparing for various government exams it became mandatory for them to get a grip over the current affairs as in most of the tests are based on Daily Current Affairs. By taking this kind of Current Affairs Quiz candidates can eventually get hold of what they have been working on. Contenders can trust us as we will update all the latest Current Affairs in this quiz. For more such quizzes check our site Emitragovt.com regularly as we will update the Daily Quiz for current affairs. 1.The Bengaluru International Airport, in partnership with Thumby Aviation Private Limited, will reportedly soon have India’s first helicopter-taxi service. The HeliTaxi service would ensure quick and seamless transfers to and from airports, Civil Aviation Minister Jayant Sinha said. 2. Japan’s SoftBank has invested a sum of $250 million in US-based online lender Kabbage. In 2015, Kabbage raised about $135 million at a $1 billion valuation. 3. Actor Robert Hardy, who portrayed the role of Minister of Magic ‘Cornelius Fudge’ in four of the ‘Harry Potter’ films passed away. He was 91. 5. Uttar Pradesh CM Yogi Adityanath announced the appointment of actor Akshay Kumar as the Brand Ambassador of Swachh Bharat Mission in the state. 6. MoS for Home Affairs Hansraj Ahir approved a proposal to rename the Mughalsarai railway station in UP after Deendayal Upadhyaya. The junction, India’s fourth busiest railway station, houses Asia’s largest railway marshalling yard. 7. The Haryana government has constituted a Scheduled Castes Development Council (SCDC) under the chairmanship of Chief Minister Manohar Lal Khattar for the implementation of plans related to this section. 8. Darshan Lal has become the first Hindu to be inducted in Pakistan’s cabinet of ministers in over 20 years. New Prime Minister Shahid Khaqan Abbasi has named Lal as the Interprovincial Coordination Minister.